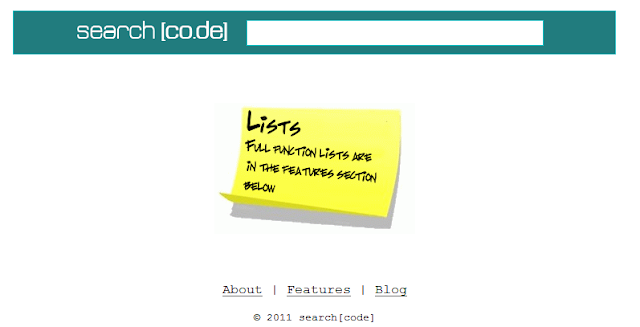 If you are a programmer or a web developer who often needs to shuffle between writing code in multiple languages, check out searchco.de – this is an instant search engine for all programming related documentation and nothing else. You type a function name and searchco.de will pull a list of all languages where that function is available along with the syntax and description. Alternately, you may prefix the function name with the language name – like jquery slide - to limit your search results to a particular language. In addition to regular programming languages, searchco.de also indexes documentation for Windows and Linux commands. However, if you are looking to search for code snippets or to debug problems in your existing code, Google’s Code Search is still your best friend. 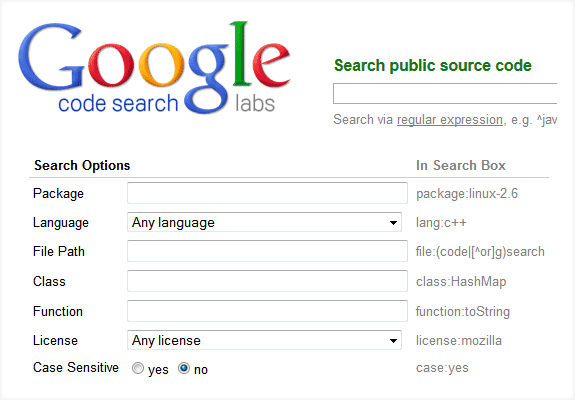 You can even find code using regular expressions, a feature that is not available inside Google's web search. Google Code Search is part of Google Labs so am not too sure if it will survive once Google retires the Labs section altogether. "A Comprehensive technology blog with great articles, how-to's, how's on all things related to computer, personal technology, software and useful web apps.Purpose of this blog is to help you take maximum advantage of the software tools ,Apps and web technologies." © 2011-2016 Techimpulsion All Rights Reserved. The content is copyrighted to Tech Impulsion and may not be reproduced on other websites.